The International Vegetarian Union is 102 years old, but it has achieved more in the last 6 years than the previous 96. This has been done by people in the developing world - where most of the world's population lives. In its first 50 years, 1908-58, IVU held 16 World Vegetarian Congresses - 15 of them in Europe. During the rest of the 20th century there were another 17 WVCs - with still over half of them in Europe. So far in the 21st century there have only been two WVCs in Europe, and there are no plans to return there until 2020. So we have seen a gradual shift away from the Euro-centric view of the world that voted down a 1915 offer to host a WVC in San Francisco because it was 'too far to go'. The same objection was raised to India in 1957 but this time it went ahead and became the first outside of Europe. As the graphic below shows, they initially didn't even cover much of Europe. 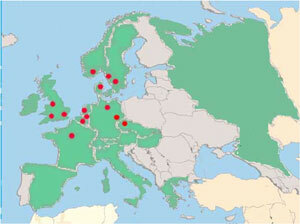 The red dots are the locations of all IVU Congresses between 1908-55. The countries in green all had national Vegetarian Societies by 1908, though several collapsed during the First World War. The 1957 Congress saw the first move outside of Europe, with a huge event in four Indian cities thousands of mile apart, and vast crowds at each of them. But the novelty soon wore off, and during the rest of the 20th century another three IVU forays into India showed gradually diminishing returns. The next big leap forward came in 1975 when the first IVU Congress in North America had a major impact, it has been credited with kick-starting the entire organized veg movement in the region. There were then three more North America Congresses over the next 25 years, but again with diminishing results. The underlying problem was the continuing Euro-centric structure of IVU. 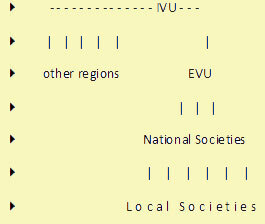 It assumed that the whole world would follow the European hierarchical system which was reinforced by the creation of EVU (European Vegetarian Union) in the 1980s (right). Europeans seem to like that kind of structure in everything, but the rest of world just doesn't work that way. It took IVU so long to understand it that by the end of the 20th century an attempt to duplicate that structure in North America was already failing badly, and elsewhere nothing had changed. The very last year of the 20th century saw the first ever congress outside of the big three (Europe, India, USA) when we went to Chiang Mai in Thailand. But what should have been another major leap forward failed to ignite the region, bogged down by infighting and personality clashes which had plagued IVU for the previous two decades. With hindsight, we can see 1999 as the turning point, where the situation was just so bad that radical change had to happen. That year we re-wrote the entire IVU constitution, changed how everything would operate, and tried to figure out how to make it work. The first years of the 21st century saw North Atlantic congresses which were not going to set the world alight, but they did give us a crucial opportunity for calm reflection and time to regroup. The real new beginning came in 2004, with the first ever IVU Congress in Latin America. We had learned the hard way that people in the developing world are perfectly capable of doing things themselves. They just need support, not interference, from those of us in the richer countries. IVU provided financial support to launch the Brazil Vegetarian Society, and underwrote it in promoting the 2004 WVC, and it was a huge success, kick-starting more veg activities all over Latin America. This time we needed to find ways of maintaining the momentum instead of letting it fizzle out as before, and our new system of appointing Regional Coordinators (RCs) with the freedom to make their own decisions began to pay off. It was also the beginning of IVU doing something more than just promoting World Veg Congresses every two years - up to then it had done little else. top: International Vegan Festival in India, 2007. That and the next in Brazil 2009 were organized by the IVU Regional Coordinators, Marly and Shankar, standing behind the banner. 2nd: the unique cruelty-free fashion show during Marly's World Veg Congress, Brazil, 2004. 3rd: Susianto (from Indonesia), IVU RC for Asia-Pacific, on the IVU stall at the International Vegetarian Food Fair and Forum in Xiamen, China, 2009.
bottom: the 1st West Africa Congress in Nigeria, 2007 - Emmanuel, IVU RC for Africa with his hands up. In 2006 we got the opportunity to rethink how we work in Asia, with enormous improvements - the first involvement in Indonesia, China and the Middle East soon followed, along with a very different approach in India. Then in 2008 we finally resolved the old clashes in Europe and EVU has also been rethinking how it operates. Meanwhile 2007 saw the first ever veg congress held in Africa, in Nigeria, followed by another in Ghana in 2009. IVU did the global fund-raising for those, but otherwise everything has been done locally - and the Africans are developing new ideas that have lessons for all of us to follow. IVU now supports a whole range of events, global, regional and sub-regional, all aimed at bringing people from different countries together. In the last six years, since 2004, we have for the first time been directly and actively involved in Brazil, China, Dubai (UAE), Ghana, Indonesia and Nigeria, soon to be followed by Bolivia and Kenya as well as more in China, India, Indonesia, Spain and the USA. This has not come from any sort of top-down centralized control system. It has come from veg*ns in the developing world devising their own solutions to local problems, and being given the support to be able put their own initiatives into practice. It is just the beginning. The above was a brief summary of the keynote speech I gave at the 39th IVU World Veg Congress in Jakarta, Indonesia, October 1-6, 2010.